What is Mechanical and Industrial Engineering? 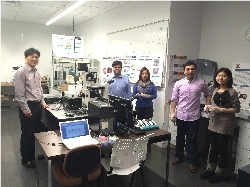 Advanced Energy Systems and Microdevices Laboratory’s energy researches are focused on the non-platinum group metal (Non-PGM) catalysts and their applications for electrochemical energy systems and industrial applications. Non-PGM catalysts have a huge potential due to the very low raw material cost compared to that of PGM catalyst in many applications spanning from catalytic devices in filtering systems or petroleum processing systems to electrochemical systems such as fuel cells or metal-air batteries, but there is still huge gap between the PGM and non-PGM to be filled by researches. The major research activities of the lab include 1) synthesizing new non-PGM catalysts for new energy systems from the sources of carbon materials (eg. Graphene) with addition of nitrogen, transition metals, and porous materials to modify the characteristics and enhance the catalytic performance of the synthesized catalysts, 2) characterizing the physical, chemical and electrochemical properties of the new synthesized catalysts by XPS, Raman, SEM, TEM, XRD, RRDE and electrochemical testing station, and 3) investigating the reaction mechanism of the new synthesized catalysts through experimental methods for a fundamental understanding of the reaction mechanism. 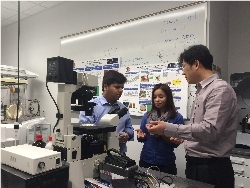 We are getting research supports from or collaborating with Brookhaven National Laboratory, CUNY Advanced Science Research Center, Rutgers XPS facility center and NJIT Otto York Center for Material characterizations for a top-notch technology supports for characterizations. The research will provide a substantial pathway to the new cost-effective and fuel-efficient energy conversion system for the next generation energy society.